Caption comp time. 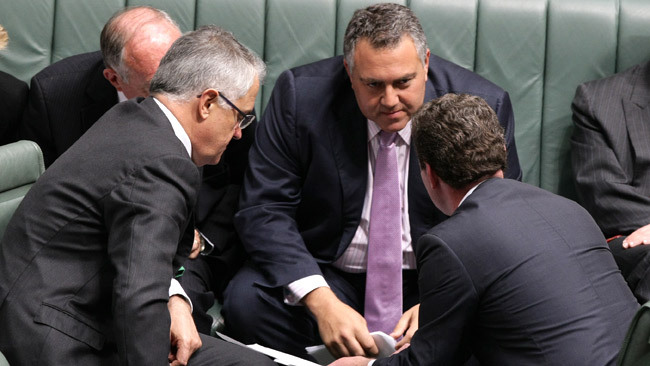 What is the brains trust of the Federal Liberal Party saying here? There’s a certain feature of political reporting that is annoying me more and more of late, it’s the apparent desire of journalists to engage in good story telling rather than striving for accuracy. While polemicists from both ends of the political spectrum have used the cover of ‘opinion writing’ to publish profoundly partisan reinterpretations of events forever, news reporters seem to be falling onto the trap of massaging their stories to spice them up too. The example today that really irked me was the ABC’s declaration that the government and opposition had negotiated to allow the renewable energy bill pass the lower house. Any school child with a basic grounding in how our parliamentary system works can tell you that the government is whichever party holds the most seats, therefore votes, in the lower house. It’s irrelevant which way the opposition votes in the lower house, the government always carries whatever motion they put up. While discussion of cross party negotiations over a bill may be important when it comes to the senate, trying to somehow suggest that the government is beholden to the opposition to pass legislation through the lower house is incorrect and adds a strange tone to the discussion. This isn’t a question of balance, or bias, it’s simply about accuracy. Journalists and commentators in the media decry governments’ attempts to ‘spin’ news to suit them better, but how can they expect to be dealt with in an open fashion when they can’t get the basics right and are perpetually looking for a ‘gotcha’ moment in every situation. This isn’t just a problem with political reporting, the release of the interim report from the Victorian Bushfire Royal Commission has seen plenty of uninformed speculation on ABC Victoria and Radio National, sometimes promoting ideas that have explicitly been dismissed by the very report they are claiming to be discussing. In this case, the ABC seem to be gunning for the scalp of CFA Chief Officer Russell Rees and are building a narrative around his failures. Some ABC presenters have also criticised the interim report for not addressing particular areas which were never going to be included until the final report, giving the impression that the Royal Commission has been negligent. The questions of balance and bias are always going to be contentious ones to address, but the news media should make a consistent effort to banish simple inaccuracies from their reporting. If news is the first draft of history, it should least try to get the basics right. Courtesy of Possum Comitatus we can see quite clearly how people have reacted to Malcolm Turnbull’s involvement in the OzCar affair. Brendan Nelson must be feeling pretty bloody smug right about now. I think that the opposition have officially given up. After spending five hours debating the Ozcar debacle on Monday, today the opposition continually interrupted question time calling for divisions to be called for procedural motions which really should have been carried on the voices. There was no doubt that the Government would lose any of the votes, it was simply an attempt to reduce the amount of time available for them in the house. Not only did the Opposition try to interrupt question time with their time wasting, they couldn’t even manage do it properly, as their second attempt to launch a censure motion was ruled out of order because it hadn’t been altered from the first one that had already been voted down. Procedural motions are an important part of managing any substantial meeting, but the opposition’s decision to call for divisions today each time one was put, rather than accepting the outcome on the voices, was the type of nonsense that people find annoying about politics. If Malcolm Tunbull believes that hi-jinx in the house will save him from the Godwin Grech shaped cloud that is hovering over him, then he’s even more politically naive than has been suggested already this week.